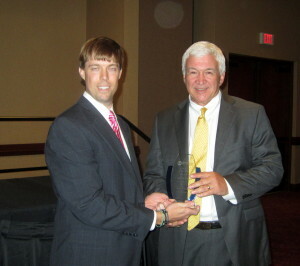 Moore, right, is pictured with Vaughan Dozier, Board Chairman of the Cayce-West Columbia Chamber. West Columbia Attorney Jake Moore was chosen as Citizen of the Year selected by the Greater Cayce-West Columbia Chamber of Commerce. Moore, who is known as Mr. Tree for his work with the West Columbia Beautification Foundation, was given the citizen of the year award at the Greater Cayce-West Columbia Chamber’s 2015 Annual Dinner, Tuesday night.